Quantum physics is most peculiar...when you wave goodbye to a ship in your universe, be sure there are others waving goodbye to the same ship in countless other dimensions. 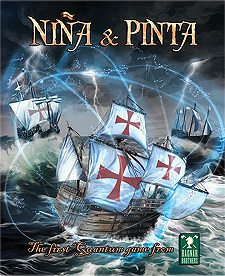 This is a game encapsulating the exploration of three New Worlds, where the great nations of Spain, England, France and Portugal send ships into the unknown and bring back gold to the Old World. This is a game where those ships cross and re-cross in space and time and where no love is lost between Captains. This is a game where the developments in one world will cause repercussions in the others. Explore, settle, combat if need be, and help your nation develop its Arts, Science, Religion, and Military expertise. Their adventure is your adventure. Their destiny and yours is to become the best in all worlds!